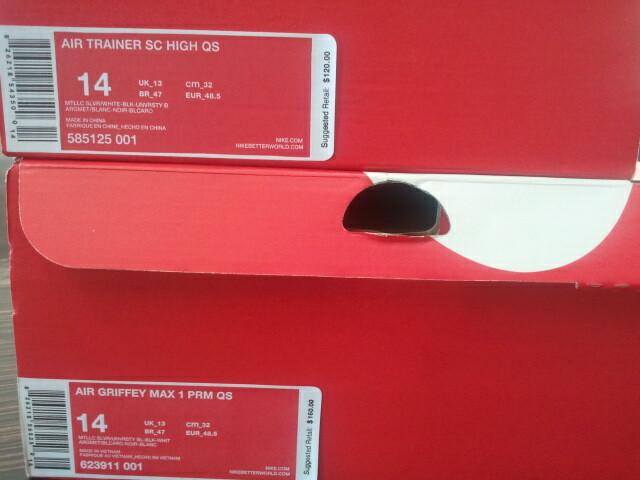 COME CHECK OUT THE NEW NIKE GRIFFY AIR MAX ALSO THE NIKE AIR TRAINER SC HIGHS. Both dressed in similar reflective metallic silver, white, and black color schemes. Each shoe is highlighted by light blue accents, and speckled paint decoration on the midsole. The Griffey Max 1 is split almost evenly between the three colors, while the Bo Jackson signature employs a white mainstay.